I’m amazed at the variety of travel gear, gizmos, and services that make life on the road easier, more secure, and generally awesome. Here is some of the cool stuff I’ve discovered in 2014. In spending three months in Peru, I had not one, but two gut-wrenching bouts of parasites and bacterial infections. I’ll spare you the gory details, but suffice it to say it’s debilitating, and incurable without medication. One of the leading causes of this yucky-ness? Water. In retrospect, I suspect even the “drinkable” water in my hotel in Lima was the cause of my second illness. So, I went out and found an ultralight water bottle with a filter that removes 99.9999% of water-borne bacteria and parasites – the Vapur Microfilter Water Bottle. I already have a Vapur water bottle and love it since it collapses and is light as air when empty, holding a formidable litre of water when full. This particular model also has a straw-like filter that ensures I never suffer a parasite again. It’s perfect for everyday drinking, as well as any future treks I do in the wilds of Peru – where I plan to return soon (more on that in another post). A longer-lasting alternative to this is the SteriPEN ULTRA which I also use all the time to clean my drinking water in countries where the water is suspect. (Here’s a review). Now with clean innards and a clean mouth, it’s time to have a clean computer. I wouldn’t want to travel and live without a VPN (virtual private network) to encrypt my internet activities and protect my computer from hackers. (See also: Financial Travel Tip #96: Using a VPN Service). For the last year I’ve been using HotSpotShield Elite on my laptop and mobile devices, and although it’s the cheapest service at $30/year, it has also been glitchy with my email, and unusable for most downloads and uploads – arguably when a VPN is needed the most. So when TunnelBear approached me to test their service for a month, I gave it a shot – and now I plan to get their full year service – a very worthy $50 investment. It’s ridiculously easy to use, and I haven’t encountered one glitch yet. You can test it out with their free version, which offers 500mb of coverage per month. Since getting Encircled’s Chrysalis Cardi last year (more on that here), every single time I wear it without fail, at least one person (usually a complete stranger) compliments me on it. 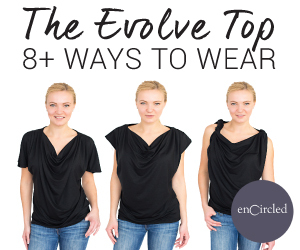 So when Encircled came out with their next super-comfy and chic design, the Evolve Top, I couldn’t wait to get my hands on it. It’s not quite as multi-functional as the Chrysalis Cardi, but there are still about 10 ways to style this very flattering shirt. Check out this video to see the Evolve Top in action. When I fly, my feet swell, often for days. It’s uncomfortable and ugly (and evidently I’m vain). So when Dr. Segal’s (a family-owned Canadian company) approached me, I knew it was time to get these compression socks I’d often heard of but never tried. They make 15-20 and 20-30mmHg true graduated compression therapy socks that reduce blood clots, ankle and foot swelling, leg pain, and increase energy. I was skeptical that a pair of socks could do all that, but then again the $35 price tag should have clued me in that they can do more than keep your feet warm. The acid test was a 24 hour journey, including a 10.5 hour flight followed shortly thereafter by a 4.5 hour flight. Before I even arrived at the airport I was doing a little jig in them – they really do energize your feet and legs. After the first flight I was free of swelling (but then again I was feet-up in first class); the second flight (no bed) tested the socks more, and although I was a wee bit swollen, it was markedly better than usual and totally gone the following morning. I’ve also used them working out to add a spring to my step, and I look forward to using them for hiking. Dr. Segal’s compression socks have officially earned a spot in my travel bag. Are you a Travel Gear Geek? Editor’s Note: Some of these products and services were provided to me for free or at discounted rates. There are also some affiliate links in this post. All opinions are my own, and I practice what I preach. What a fabulous range of finds Nora. I’m always amazed at the ingenuity of what people create and they clearly have practicality and the traveller in mind. I’m intrigued by that first water bottle (sorry to hear of your illness). Health is something we should never compromise on. I practise a bit with VPNs so it is great to hear what you use. I might give it a try in the future. Yes, I’m stoked to have found the Vapur water bottle with a filter – perfect for an ultralight traveler like me! And I couldn’t be happier with TunnelBear; check them out. I am obsessed with travel gear and gadgets and I am loving that water bottle. When I lived in Malawi (10 years ago!) I had a hard water bottle designed with a similar concept and I also had collapsible Platypus brand water bottles in which I would decant boiled water. I love that there is now a soft side version of my two old favourites! Thanks for the head’s up! I still have my Vapur bottle and it works fine, though it’s always worth looking through the reviews, because things can change. I have to travel a lot, so for me, VPN is an absolutely necessary tool. I am using https://www.hide-my-ip.com/ (you should better have a look) for quite sometime and found it pretty fast and reliable. Hide My IP encrypts Internet connection. Therefore, protects user’s online privacy by changing real IP with HMIP. Thanks for the tip! How much do they charge? They charge $2.95/mo includes VPN + Smart DNS to unblock any streaming site, up to 5 devices allowed per account. Sweet – thanks for the intel, Alicia! Hey, long time fan, so when I wanted a toothbrush that was better than the standard thing you see all the time, I turned to you. It says that you can refer friends, and I don’t know if that would benefit everyone or just you but I thought it’d be worth a shot to ask if you have one? Thanks for the head’s up, Angeline!